It is pleasant to finish the year with one of the nicest half marathons I have run. On Saturday I ran the Kiawah Island Half Marathon in South Carolina’s Low Country. Anyone looking for a South Carolina race for their 50 State challenge should look at running this one. It is a good one! There were plenty of things to like about this race. First, the race course was beautiful – shaded with Live Oak trees dripping with Spanish Moss. (Live Oaks are considered evergreens since they don’t lose their leaves in the winter.) Thanks to these trees, there were only a few places where the runners were out in the sun. Second, there was plenty of wildlife to see along to course. Kiawah Island is home to all sorts of critters including many types of birds, deer, bobcats, turtles, and alligators. The full marathon course went past a spot known for frequent sightings of bobcats. As we ran through the marsh land that is typical in the Low Country, I saw cranes, ducks, and herons. A few Monarch butterflies fluttered by me as I ran. It was lovely to see all the creatures. I decided that a place like that was probably also home to snakes – and lots of them. 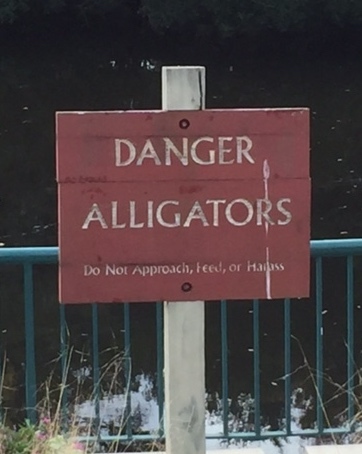 There were signs to stay out of the water because of the alligators but nobody ever mentioned snakes. I hate snakes. This was not a race where I would ever think about going off into the woods or bushes to go to the bathroom. Who knows what kind of creatures would be in there! Next, the course was the flattest that I have ever seen. My Garmin said that the elevation gain was only 20 feet. Compared to running in Estes Park, Colorado, that is nothing. I have had my share of running hills this year. A flat course was a great way to end the year. Finally, the runners were treated to a big post-race party. Under a huge tent, the runners enjoyed a buffet of several different pasta salads, quinoa, cornbread and bean soup while a band provided entertainment. It was a fun atmosphere to celebrate the end of a busy racing year. I want to ring the bell! 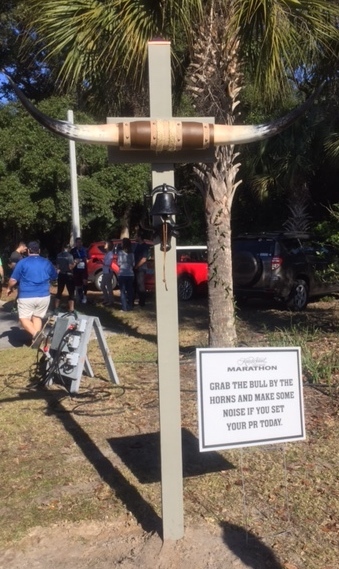 I have run several races this year where there was a bell at the finish that you could ring if you set a new PR (personal record). I have wanted to ring one of those darn bells for a long time. The Kiawah Island race had one, though I didn’t see many people ringing it. I decided when I saw that bell, my 2016 goal will be to set a new PR for the half marathon. I am not sure what race I will be able to do that in but my running coach is ready to up my training to get me in shape. Yes, goals are good. Thinking of running in Kiawah Island? Take time to visit Charleston, a fascinating city with a rich history. 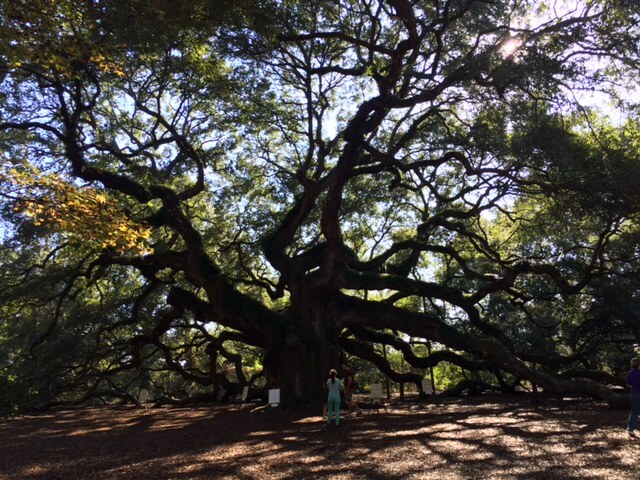 I also recommend making a side trip to see the Angel Oak – a Live Oak believed to be over 1500 years old, perhaps the oldest Live Oak tree in the country and possibly the world.